During lunch today I went for a short walk through the Ashuelot River Park in Keene, NH. About five minutes into the walk, I detected something large moving across the river near the opposite shore. As I got closer, I realized that it was a large Great Blue Heron which was perched on a dead tree that was sticking out of the water. The heron appear to be cleaning itself, twisting into a number of different odd contortions to reach the feathers on its back and chest. 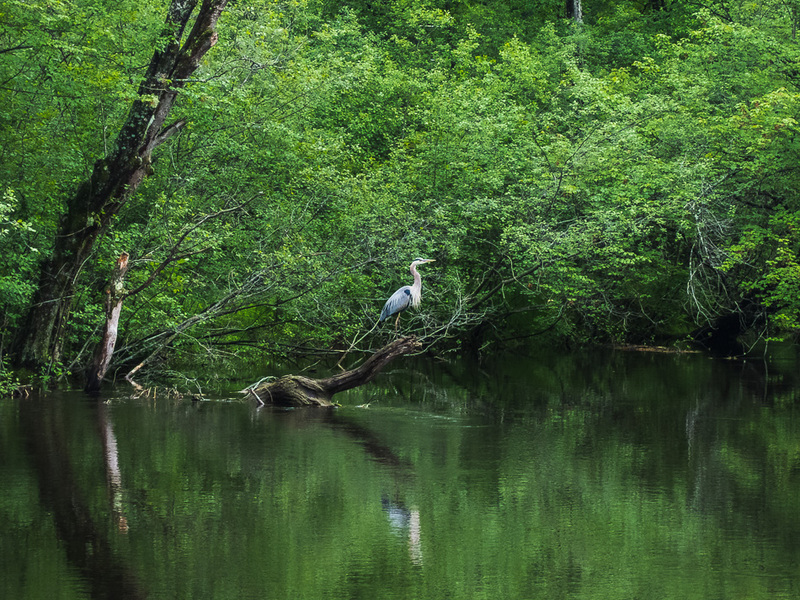 I was able to watch the heron for about ten minutes, and near the end it hopped up onto the topmost branch and worked its way out to the end which allowed me to capture this photo. Unfortunately I only had a compact camera with a limited zoom, and I was unable to capture the interesting black markings on the top and back of this heron’s head. I was very grateful to have some kind of zoom capability, for an iPhone shot of this heron would have been very disappointing.